One of the most powerful and wealthiest women in Elizabethan England put an indelible stamp on Derbyshire through the construction of Hardwick Hall and Chatsworth House and the extension of Bolsover Castle. Much-married Bess of Hardwick was a personal favourite of Queen Elizabeth I and her main lady in waiting. Four hundred years later, her story will be brought to life on stage for the first time when the world premiere of Bess is unveiled at Derby’s Guildhall Theatre. The script has been penned by award-winning playwright Kevin Fegan, who lives in Belper. He became interested in the story of the second richest woman to Queen Elizabeth I while growing up in Mansfield. Kevin said: “I used to walk over to Hardwick, see the hall and walk around the grounds. I had no idea at the time that I’d later be writing a play about Bess. Bess will be played by Michelle Todd who grew up in Sutton in Ashfield. 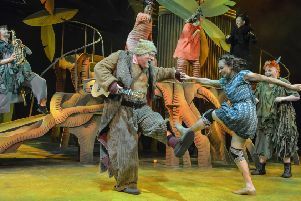 The production, which blends theatre and film, is suitable for audience members aged 12 years upwards and runs at the Guildhall Theatre from September 28 to October 1. Kevin’s last play at the Guildhall, Slave, won the Pete Postlethwaite Best New Play Manchester Theatre Award.